Enterprise operations in Spain are hitting their stride with high marks in customer service and record profitability for the operation. 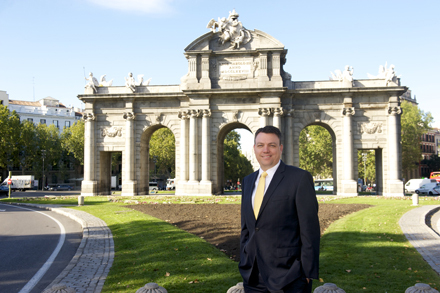 “It’s quite exciting to reach these milestones,” says Karsten Summers, who became General Manager of Spain after Enterprise’s acquisition of Spanish rental car company Atesa in early 2012. Of course, rapid progress toward top-tier performance is not an unusual feat for Karsten or the teams he’s led. It’s been his stock-in-trade since joining Enterprise 15 years ago, after graduating from the University of California-Santa Barbara. Starting off as a Management Trainee in Santa Barbara, CA, Karsten advanced quickly through the ranks during the early years of his career — eventually taking a Regional Account Manager position in 2002, with primary contact responsibilities for the area’s big insurance company accounts. Karsten has seen firsthand that everybody benefits when a team hits on all cylinders. “Because of our performance, I saw a large percentage of my people in the area get promoted. That track record helped me earn the next big promotion in Seattle,” Karsten says. By 2007, he became Regional Vice President and Enterprise Holdings’ youngest Corporate officer. Karsten’s bilingual skills haven’t hurt, either — especially as the company continues to expand beyond the continental United States. His fluency in Spanish comes from having a father who worked throughout Latin America during Karsten’s childhood. When named General Manager in Puerto Rico in 2009, Karsten’s fluency provided a distinct advantage, helping him communicate effectively with local officials and employees. The cross-cultural experience in Puerto Rico also proved valuable in preparing Karsten for his current role in Spain. All in all, his early impressions are overwhelmingly positive.